This quickstart shows how to use .NET and the Azure Cosmos DB Table API to build an app by cloning an example from GitHub. 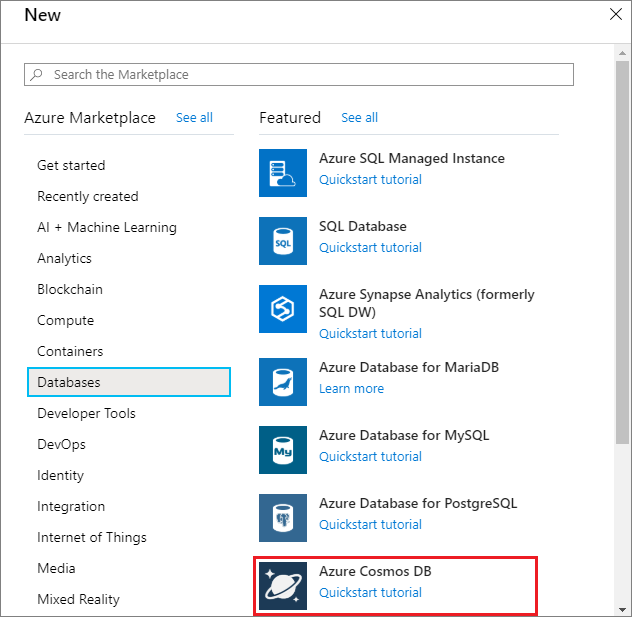 This quickstart also shows you how to create an Azure Cosmos DB account and how to use Data Explorer to create tables and entities in the web-based Azure portal. If you don’t already have Visual Studio 2017 installed, you can download and use the free Visual Studio 2017 Community Edition. Make sure that you enable Azure development during the Visual Studio setup. In the left navigation pane, select Create a resource. Select Databases and then select Azure Cosmos DB. Then enter the same unique name as provided in ID Select Create new. Then enter a new resource group name for your account. For simplicity, use the same name as your ID. 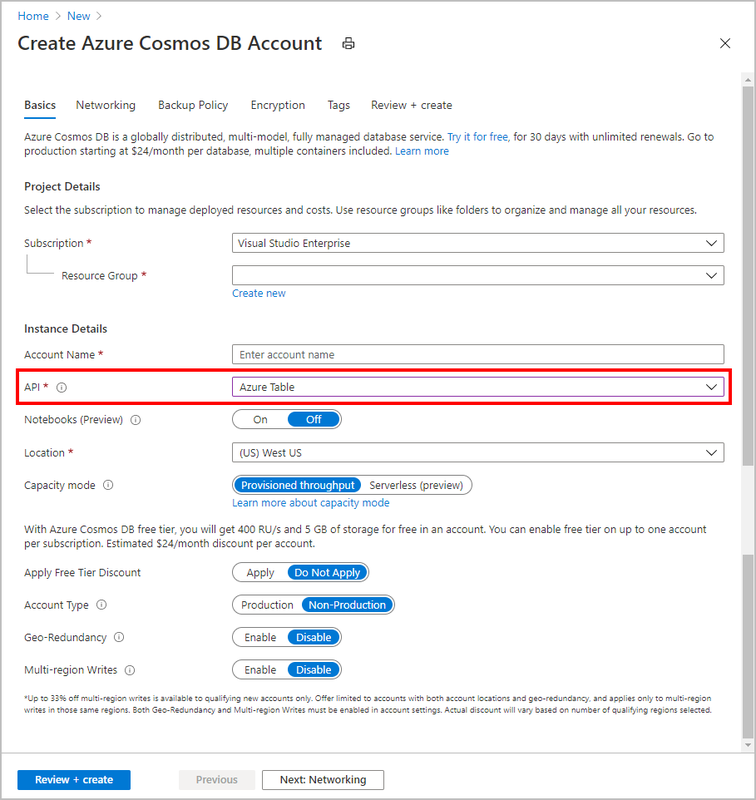 Account Name Enter a unique name Enter a unique name to identify your Azure Cosmos DB account. The ID can use only lowercase letters, numbers, and the hyphen (-) character. It must be between 3 and 31 characters long. API Azure Table The API determines the type of account to create. Azure Cosmos DB provides five APIs: Core(SQL) for document databases, Gremlin for graph databases, MongoDB for document databases, Azure Table, and Cassandra. Currently, you must create a separate account for each API. Select Azure Table because in this quickstart you're creating a table that works with the Table API. Learn more about the Table API. Location Select the region closest to your users Select a geographic location to host your Azure Cosmos DB account. Use the location that's closest to your users to give them the fastest access to data. You can leave the Geo-Redundancy and Multi-region Writes options at their default values (Disable) to avoid additional RU charges. You can skip the Network and Tags sections. Select Review+Create. After the validation is complete, select Create to create the account. It takes a few minutes to create the account. You'll see a message that states Your deployment is underway. Wait for the deployment to finish and then select Go to resource. You can now use the Data Explorer tool in the Azure portal to create a database and table. Click Data Explorer > New Table. The Add Table area is displayed on the far right, you may need to scroll right to see it. In the Add Table page, enter the settings for the new table. Table Id sample-table The ID for your new table. Table names have the same character requirements as database ids. Database names must be between 1 and 255 characters, and cannot contain / \ # ? or a trailing space. Data Explorer displays the new database and table. You can now add data to your new table using Data Explorer. In Data Explorer, expand sample-table, click Entities, and then click Add Entity. Now add data to the PartitionKey value box and RowKey value box, and click Add Entity. You can now add more entities to your table, edit your entities, or query your data in Data Explorer. Data Explorer is also where you can scale your throughput and add stored procedures, user-defined functions, and triggers to your table. Now let's clone a Table app from GitHub, set the connection string, and run it. You'll see how easy it is to work with data programmatically. 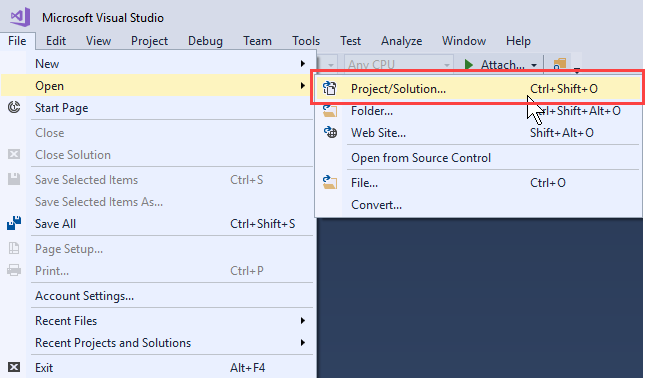 In Visual Studio, from the File menu, choose Open, then choose Project/Solution. Navigate to the folder where you cloned the sample application and open the TableStorage.sln file. Now go back to the Azure portal to get your connection string information and copy it into the app. This enables your app to communicate with your hosted database. In the Azure portal, click Connection String. Use the copy button on the right side of the window to copy the PRIMARY CONNECTION STRING. In Visual Studio, open the Settings.json file. 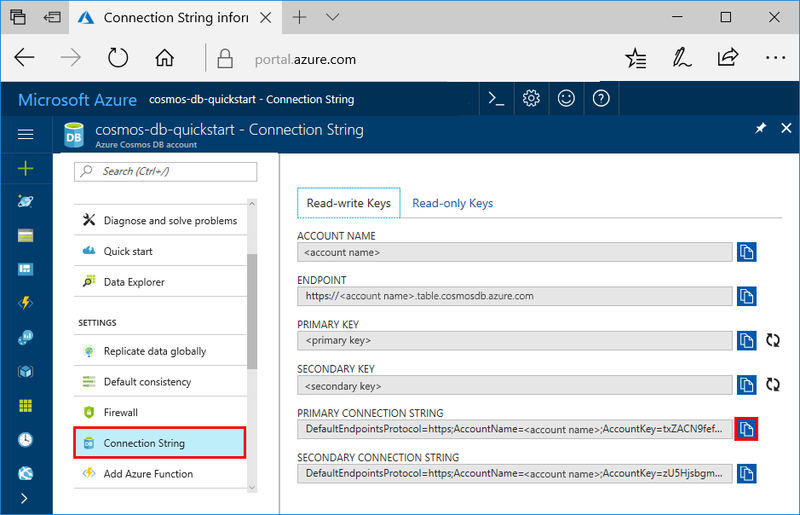 Paste the PRIMARY CONNECTION STRING from the portal into the StorageConnectionString value. Paste the string inside the quotes. "StorageConnectionString": "<Primary connection string from Azure portal>"
Press CTRL+S to save the Settings.json file. 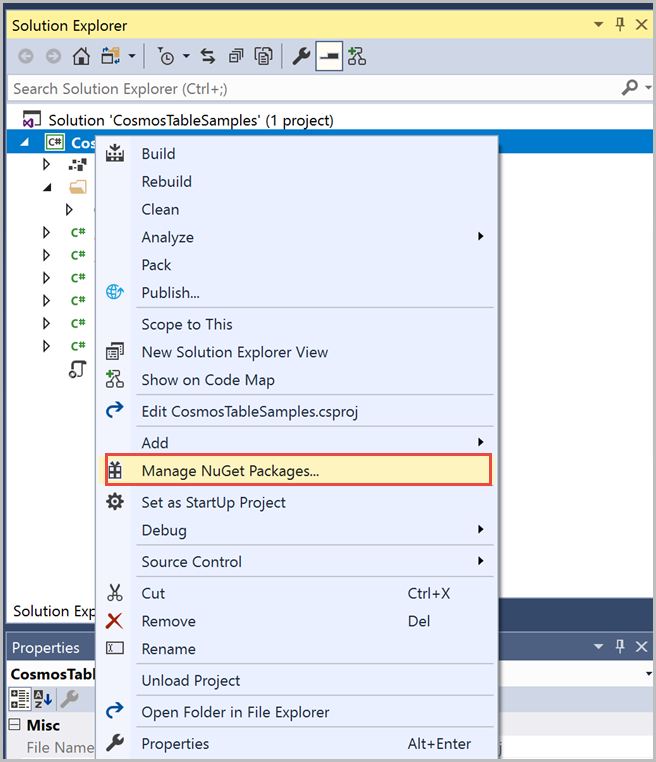 In Visual Studio, right-click on the CosmosTableSamples project in Solution Explorer and then click Manage NuGet Packages. In the NuGet Browse box, type Microsoft.Azure.Cosmos.Table. This will find the Cosmos DB Table API client library. Note that this library is currently available for .NET Framework and .NET Standard. Click Install to install the Microsoft.Azure.Cosmos.Table library. This installs the Azure Cosmos DB Table API package and all dependencies. When you run the entire app, sample data is inserted into the table entity and deleted at the end so you won’t see any data inserted if you run the whole sample. However you can insert some breakpoints to view the data. Open BasicSamples.cs file and right-click on line 52, select Breakpoint, then select Insert Breakpoint. Insert another breakpoint on line 55. Press F5 to run the application. The console window displays the name of the new table database (in this case, demoa13b1) in Azure Cosmos DB. When you hit the first breakpoint, go back to Data Explorer in the Azure portal. Click the Refresh button, expand the demo* table, and click Entities. The Entities tab on the right shows the new entity that was added for Walter Harp. Note that the phone number for the new entity is 425-555-0101. Close the Entities tab in Data Explorer. Press F5 to run the app to the next breakpoint. When you hit the breakpoint, switch back to the Azure portal, click Entities again to open the Entities tab, and note that the phone number has been updated to 425-555-0105. The app adds entities for use in an advanced sample app that the Table API currently does not support. The app then deletes the table created by the sample app. In the console window, press Enter to end the execution of the app. 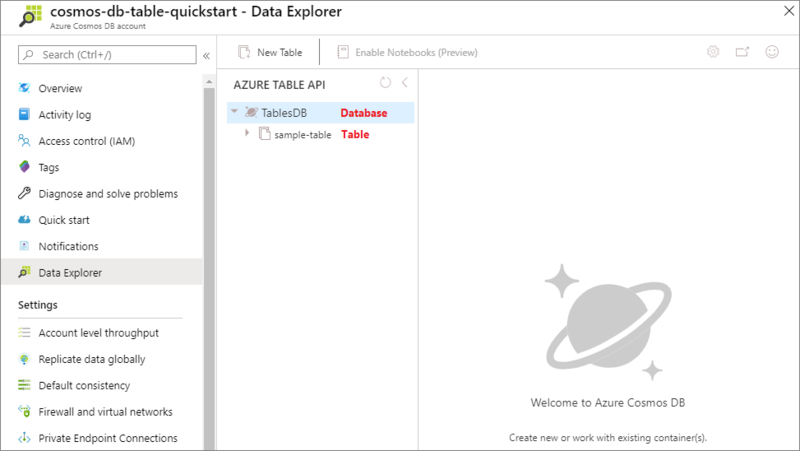 In this quickstart, you've learned how to create an Azure Cosmos DB account, create a table using the Data Explorer, and run an app. Now you can query your data using the Table API.